Pretty much the only city in Thailand that anybody outside of the region has ever heard of is Bangkok, both famous as a tourist destination and infamous for the debauchery it plays host to. Chiang Mai also gets a good bit of press. But there was a time when the center of culture and politics was entirely different. Once upon a time the capital of Thailand was a city called Ayutthaya. This was back when Thailand went by another name: Siam. If you’re like me, the only bell rung by the word “Siam” is that is was the territory where 6-hour long games of Risk were always lost. I could never get my troops up from Australia fast enough. I’ll do my best to put my childhood board game baggage aside for this article though. Siam was one of the great kingdoms of the ancient world. 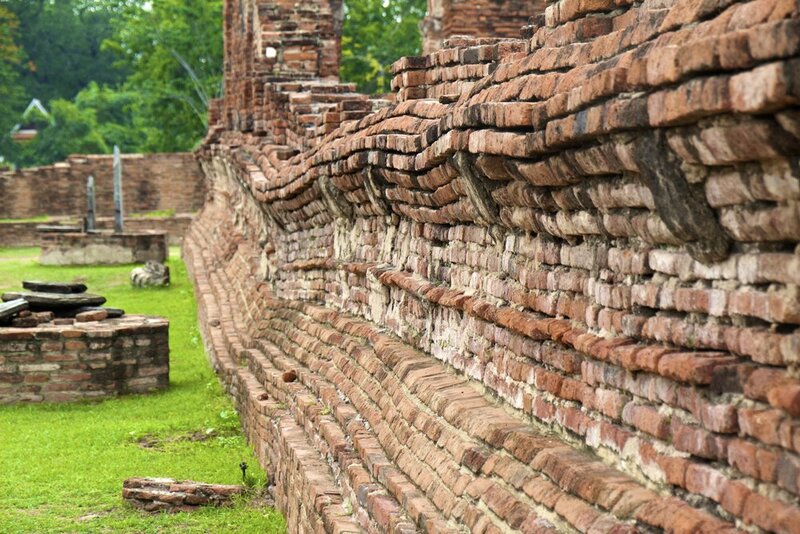 For a period of a few hundred years from the 1300s to the 1700s the capital of Siam was Ayutthaya: the Invincible City. The wealth of Siam was the stuff of legends. The kingdom was friendly to foreign traders from all corners of the world. 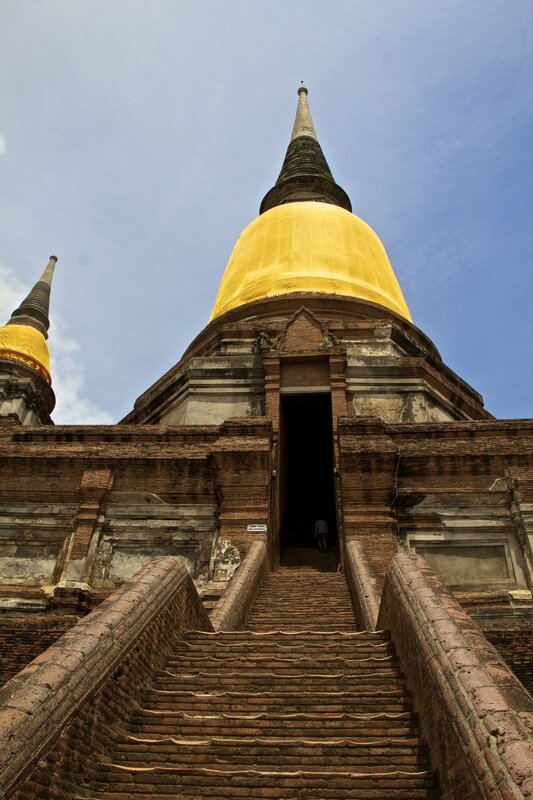 They were allowed to set up permanent encampments outside the walls of Ayutthaya from which to conduct their business. When they returned from their far-flung voyages they told tall tales of a city of gold and battle elephants. French ambassadors returned home to tell King Louis XIV of a city whose wealth and sophistication rivaled that of Paris. Traders from Persia, India and Japan returned home with extravagant gifts for their kings. England and Holland bickered to gain diplomatic favor with this exotic power of the Far East. Ayutthaya was one of the wonders of the ancient world: a city totally coated in gold and studded with jewels the size of tangerines. Yeah, things were going pretty well for Siam. In the old world national borders were blurry, shifting frequently and a never without bloodshed, but at the height of it’s power, Siam extended into what is now modern-day Cambodia, Laos, Burma, Malaysia and China. By the mid 1700s the 2 major powers in the region were Siam and Burma. Cue the Burmese-Siamese War, naturally. The war was brief but catastrophic for Siam. Burma sacked Ayutthaya and stripped the city of all its spoils. They pulled the gold from the palace walls and the jewels from the temples, and then set it all ablaze. 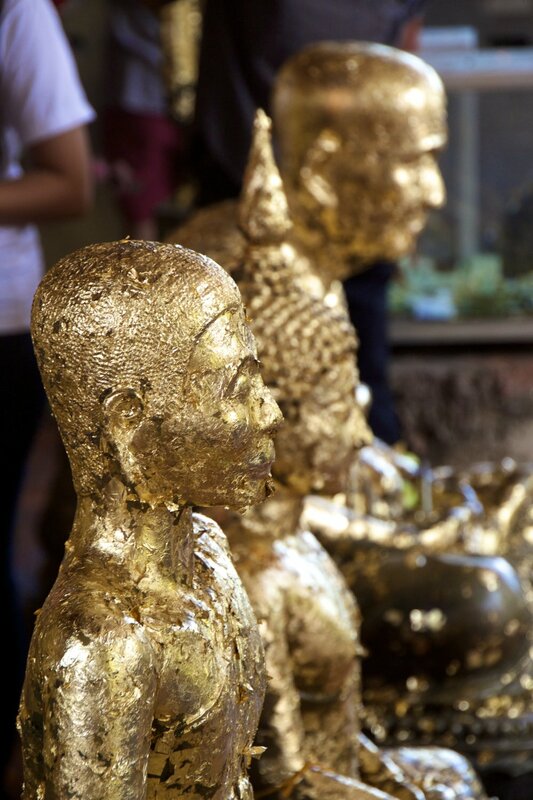 They decapitated thousands of gold statues of Buddha as a sign of disrespect to the king and took Siamese citizens as slaves. The Siamese army was forced to retreat to what is now Bangkok. 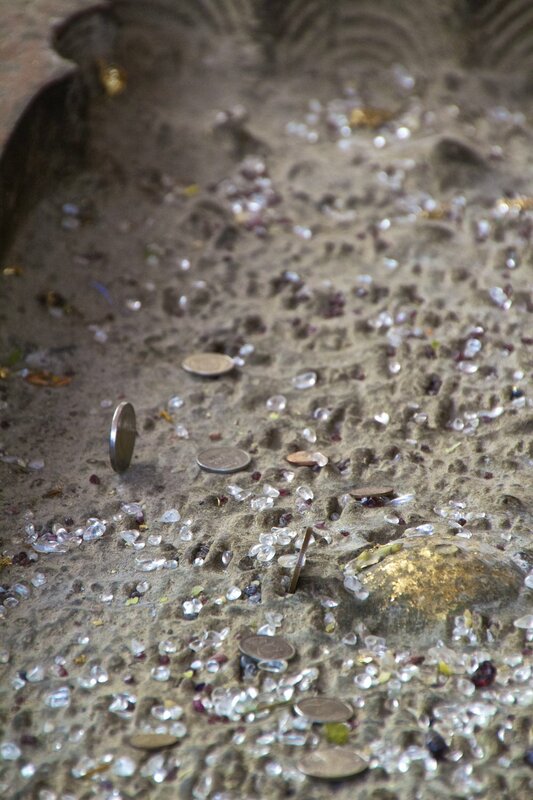 They later re-took the city and drove the Burmese out of their lands but it was too late to save all of the gold. The wealth of Siam was gone. The golden city that existed during the golden age of the Siamese Empire has since been lost to the sands of time, like Eldorado or Atlantis... but it really did exist once. 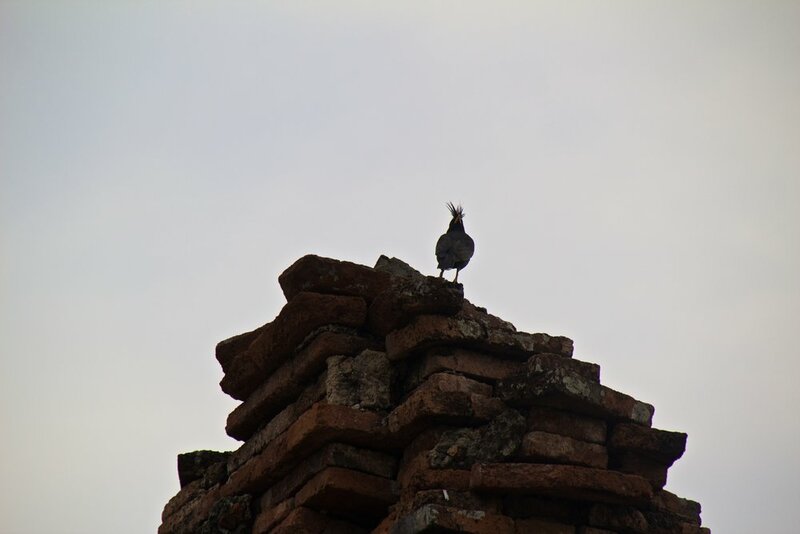 That is what we will be exploring in this post: the ruins of the ancient city of Ayutthaya. It might not look like much now, but you can still use your imagination! Once upon a time every structure you are about to see in these photos was coated in gold and jewels like caramel on an apple. Actually try to picture that in every picture you are about to see. This was our first stop of the day. It is a grand Buddhist monastery. 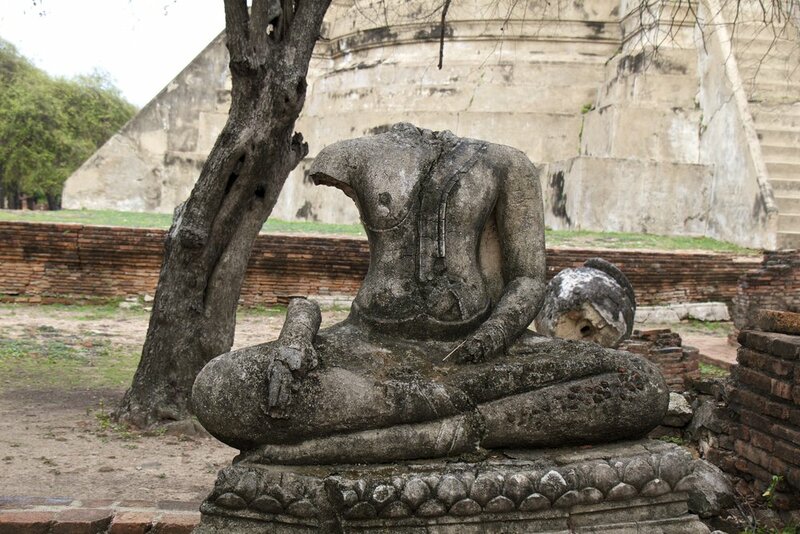 Like everything else in Ayutthaya, it is a shadow of what it once was, but it was still pretty crazy. It is even crazier to think that it was all once coated in gold. Like, I can’t even imagine. Luckily, Nicky, my host (and tour guide), comes from a Buddhist family and was at one point an actual tour guide of these sites so she filled me in as we went. This would all have been way over my head otherwise. We walked around the temple clock-wise because going counter-clock-wise is apparently bad luck. She stopped at some of the shrines to pray for good luck while I awkwardly took pictures in the background. She explained everything I was seeing as we walked. I will do my best not to misrepresent what she told me. 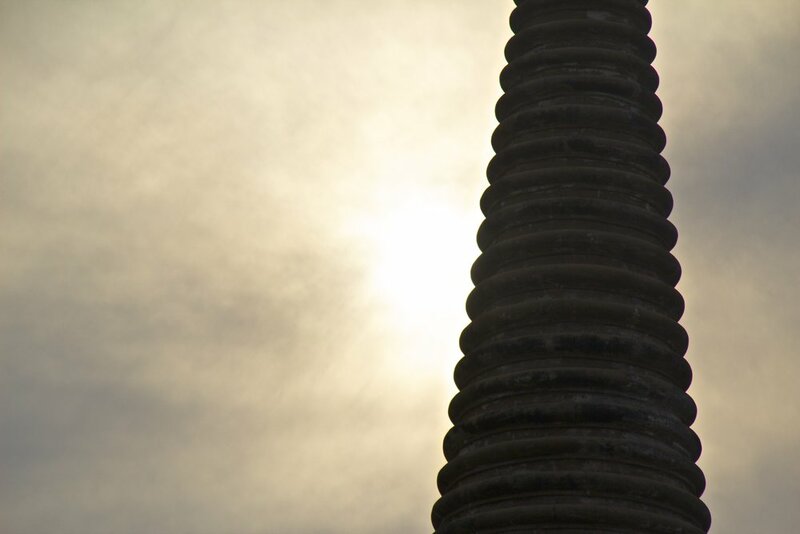 There was a giant stone spire that stood at the center of the whole complex. There were stairs that led up into it. 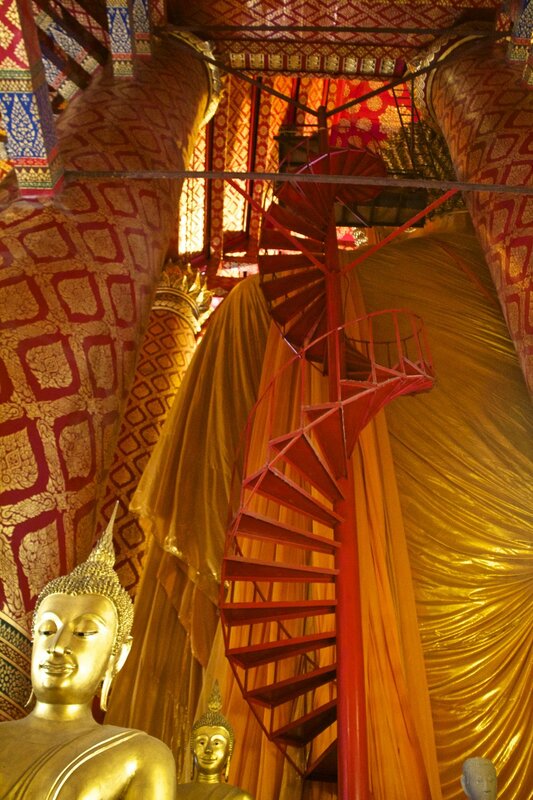 At the top of these stairs was a circle of Buddha statues that had been plastered particularly heavily with these golden papers. 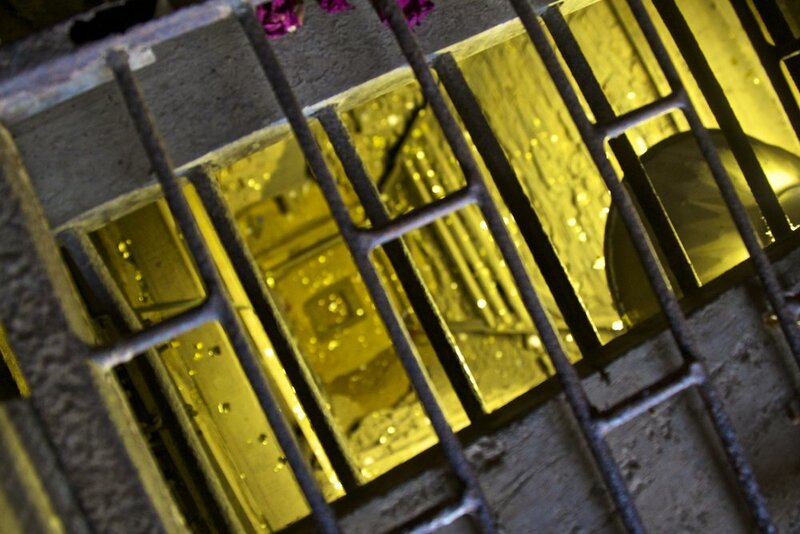 They surround a deep hole that had been covered by a metal grate. Deep at the bottom of that hole is where the Siamese hid a very important, ancient Buddhist text. They did a good job hiding it because the Burmese never found it. 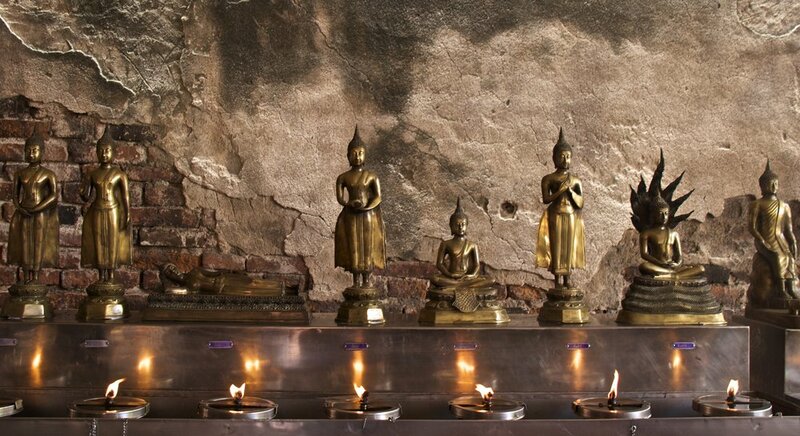 Thus, it returned safely to the hands of the Siamese when they retook Ayutthaya. 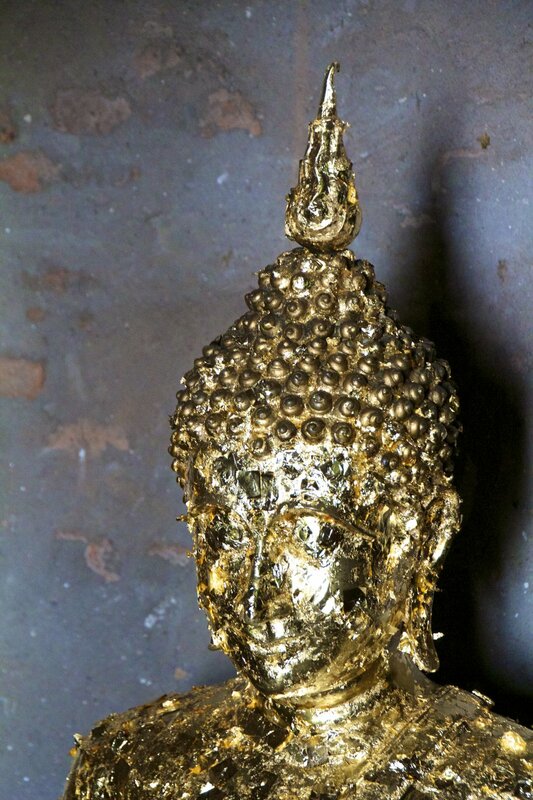 Many of the statues of Buddha were covered in sticky gold paper. 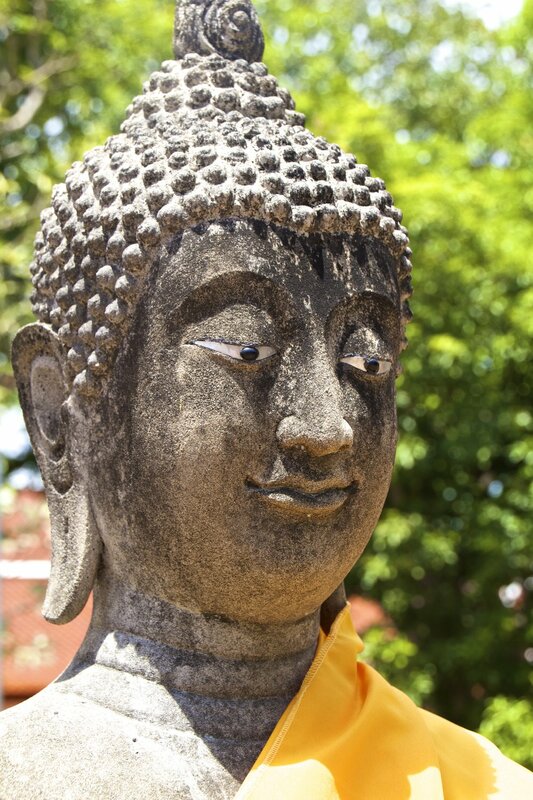 Putting these papers on these statues is a way that people can honor Buddha: by making him more beautiful. 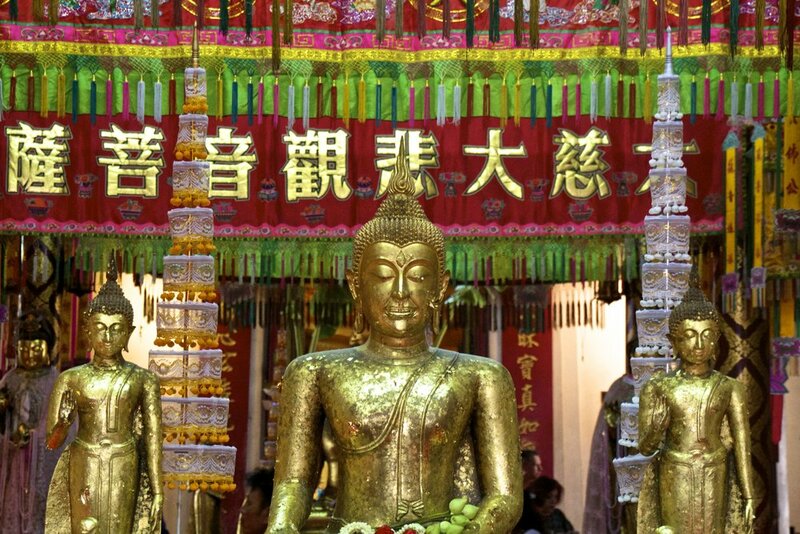 Every statue of Buddha that surrounds this temple represents a real person – a prominent monk from the past. Some of them have been clothed in the traditional orange sheet, on which there are usually inscriptions. Families will provide these sheets for luck. It is true that this is a historical site, but it is also still an active monastery. Thai people often visit just to pray. 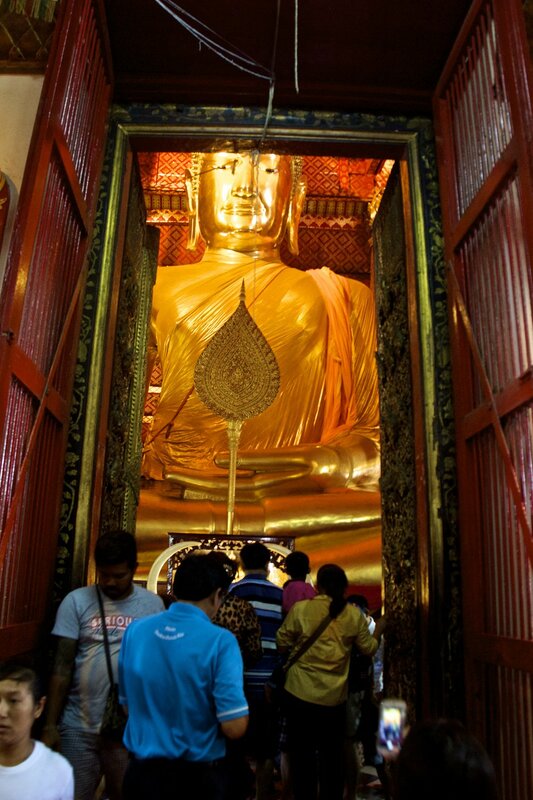 Here’s probably the best peek I’ll ever get to have into ancient Siam as it was: a 55-foot tall golden statue of Buddha. It was… excessive. It is part of a pretty large temple complex, which clearly shows some Chinese influence in it’s various shrines. 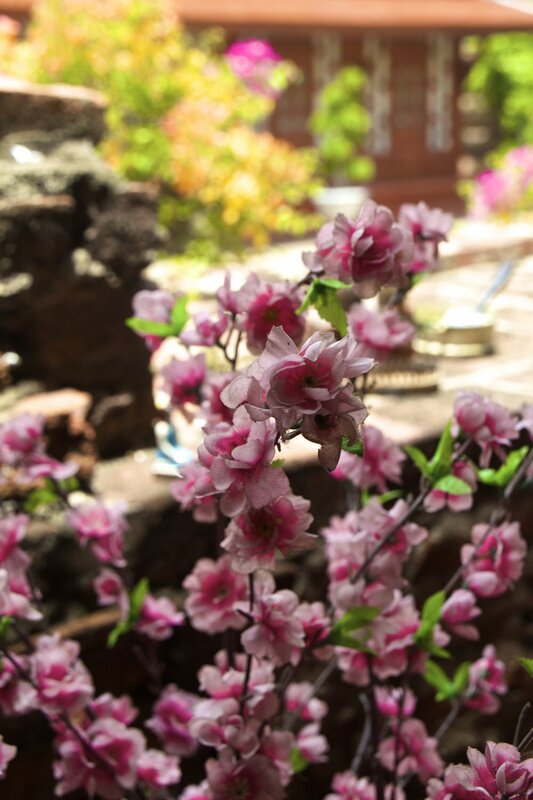 Here are some photos from just outside the giant Buddha room. 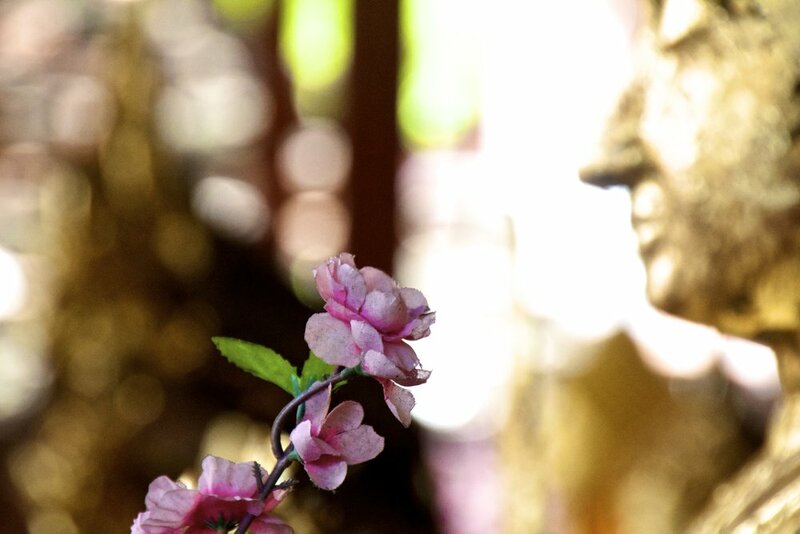 Tell Buddha what you want - what are you hoping will happen? Then tell him something along the lines of “If this will come true, let me lift this elephant”. Try to lift the elephant. If you can lift it, the answer is yes. If you can’t, you’ve been denied. Try to lift the elephant again. Now it is the opposite of before. If you can lift it, it means “no,” if you can’t, it means “yes”. Apparently Nicky’s mother had been able to lift it once. They asked me if I wanted to try it. Why not? I really have no personal connection to Buddha but that doesn’t mean that I can’t talk to my own vision of God. I knelt down next to the elephant, picked something on my horizon that was causing me stress and asked the question. Here’s the issue – I’m easily twice the size of the typical Thai person. I’m 6-4 and about 200 pounds, whereas the “ideal weight” for a Thai person is less than half that. This meant that lifting this little elephant was going to be far less of a feat of strength of me than for them. At the end of my question I pulled up with my pinky and hey! I lifted it. It wasn’t that difficult either. My hosts gave a little cheer. “Yeah… but… I don’t know if it really counts for me right now…” I started. My hosts laughed and told me to try part 2. I lifted it again. They laughed more at how big I am. They asked if it felt heavier the 2nd time. I want to say yes; it really did feel heavier the 2nd time. But maybe my pinky was just tired. Who knows, dude. The results were inconclusive I guess. I need a heavier elephant. Wat Mahathat is the ancient royal palace complex and perhaps the most grandiose of all the ruins that are a part of Ayutthaya. It is reminiscent of the temples at Angkor in neighboring Cambodia. The ruins of Angkor though, for all their intrigue, were never anything more than stone. 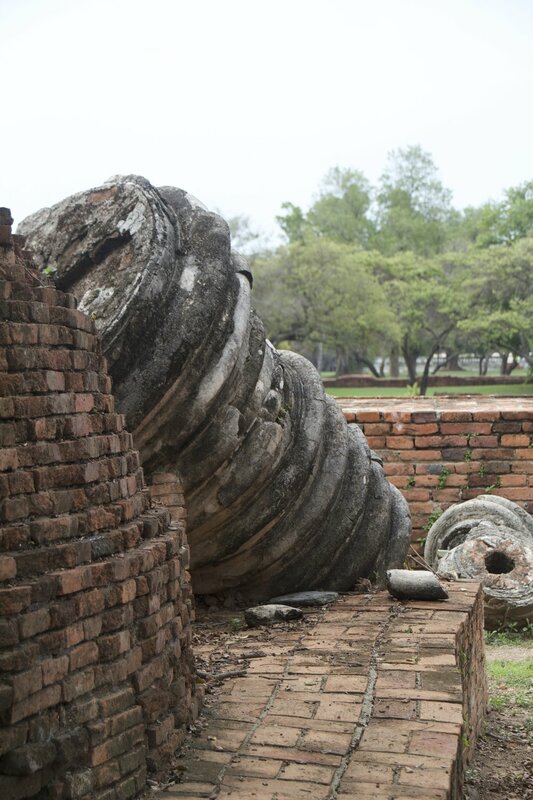 The ancient city of Ayutthaya is a skeleton of what once was. Today the original shapes of all the structures have been restored using cement, but everything here was once covered in solid gold. The dead trees pushing through the bricks and stones paint an eerie picture of a great battle that once took place here. Row after row of headless statues of Buddha stand as reminders of the people that lost their lives at the hands of the Burmese so many years ago. Some of them have had their heads glued back on, as shown by the ring of cement that encircles their necks. Thai people still don’t like the Burmese. Likewise, the Burmese still do not like the Thais. It’s just one of the old world rivalries that has endured through the years. The stories conflict on who it was exactly that initiated the hostilities but it is a deep-seeded hate that separates these 2 nations. 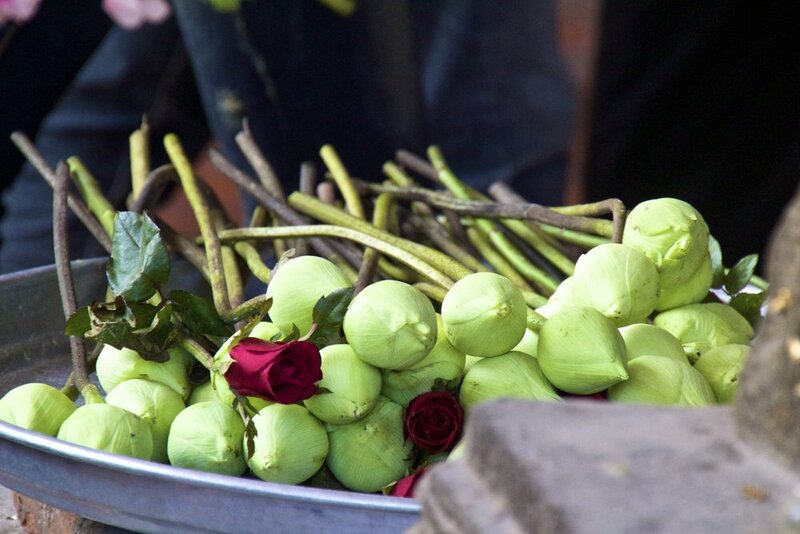 It is sort of a traditional Thai value at this point and it is passed down through generations. Even my host, a 3rd culture child who had spent most of her life living abroad, admitted a strong prejudice against the Burmese. It’s an ugly dynamic, but I suppose that every nation, race and culture has some sort of historical enemy. Vietnam hates China. India hates Pakistan. Israel hates Palestine. We in America have our own version of this. Granted, America isn’t old enough to have this much history with anybody, but I think I’ve experienced the same sort of conditioning when it comes to communism. People don’t care as much anymore, but I was born at the end of the Cold War. Communism wasn’t exactly a topic of conversation in my house growing up, but everyone definitely had opinions. As a result, my knee-jerk reaction to all the communist propaganda I’ve been exposed to during my time abroad has been to be very wary. I don’t like it, but it’s true.